…spin around dress with sleeves. Ha! Got you, didn’t I. I’m so sneaky like that. I really wanted to sew up a diaper, but today was a crazy day and when I finally sat down to start I realized that I didn’t have the fabric I really wanted, and since this will be my new cover I didn’t want to settle. 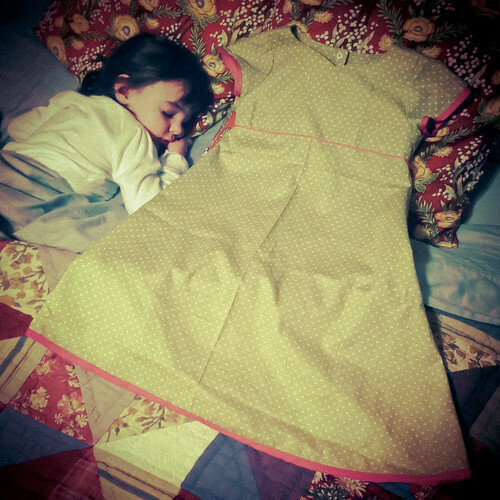 Molly was so excited that I decided to sew her another dress instead that she waited patiently in my bed as I sewed. Poor girl didn’t even get to see it finished, as she finally passed out for the night about 5 mins before I was done. It will make a nice surprise in the morning, right? Comments Off on You guessed it!